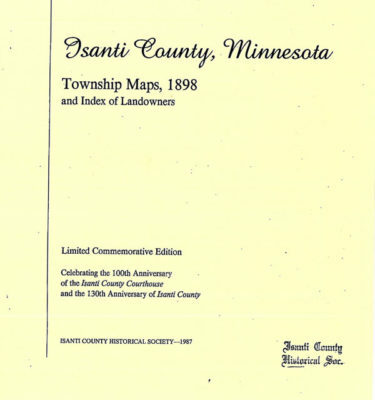 Isanti Township was established in 1872. The northern part of the township near Paul’s Lake was the site of the original town of Cambridge, platted in 1856. Several letters of Harriet Griswold are on file with the Minnesota Historical Society which tell of the hardships she suffered in the area from 1856 to 1861 following the death of her husband, Allen, who had been of those active in sales of Cambridge lots. A number of Swedish immigrants came by way of the Chisago Lakes area to the township in the early 1860’s to begin the loosely organized town of Isanti. Among them were Daniel Lundquist, Jonas Norell, the Shuleans, Eastlunds and the Noreliuses. George Nesbitt, a New Yorker, had a hotel and livery barn at the junction of the Princeton-Sunrise Road and the Anoka-Brunswick Road. The latter was sometimes referred to as the Manomin Trail-Manomin being the Ojibway term for wild rice. After Nesbitt moved to Cambridge in the 1870’s, the town of Isanti virtually disappeared until it was re-established at the turn-of-the-century in Section 30 when the railroad was built.